KUALA LUMPUR (Oct 16): Eco World International Bhd (EWI), spearheaded by Tan Sri Liew Kee Sin, has proposed to list as a special purpose acquisition company (SPAC) on the Main Market of Bursa Malaysia. Eco World has expressed its interest to subscribe for 1.13 billion shares in EWI together with a similar number of free detachable warrants for RM562.5 million. The subscription will see Eco World owning 30% of EWI's expanded issued base upon completion of the latter's listing. Eco World said EWI's listing was in line with the latter's intention to venture overseas. According to Eco World, the listing aimed to raise funds to acquire real estate assets such as vacant land and redevelopment projects in countries such as the UK and Australia. EWI has no operations or income-generating business at the moment, according to Eco World. Eco World said EWI, as a listed entity, would be able to undertake a larger and more diversified pool of projects globally compared to what Eco World would be able to do on its own. "This enables Eco World, as a financial investor in EWI, to gain a wide exposure to global property markets without the need to incur the cost of maintaining its own international management team. 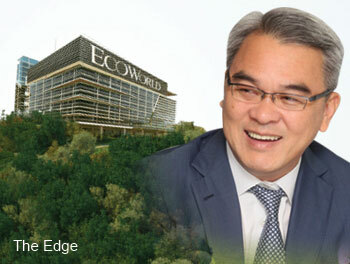 "Given that EWI will be solely responsible for the day-to-day management of the international projects undertaken by EWI, Eco World will therefore be able to stay focused and channel more resources to fund its business development and expansion activities in Malaysia," Eco World said. Liew is the former president and chief executive officer of property developer SP Setia Bhd. He was appointed as a director in Eco World in May this year. At 12.30pm, Eco World shares lost 16 sen or 4% to settle at RM3.99 for a market capitalisation of RM1.01 billion. The stock has gained 5% this year, outperforming the FBM KLCI's 5% decline.